In late winter 2012 I was wandering around downtown Brooklyn, on Fulton, Duffield, and Livingston Streets. Fulton has undergone a change lately, as the venerable Fulton Mall, instituted in 1979, has undergone a remake with curved, Dystopian-looking light poles and updated signage and shelters. It had been frozen in time for about 30 years. 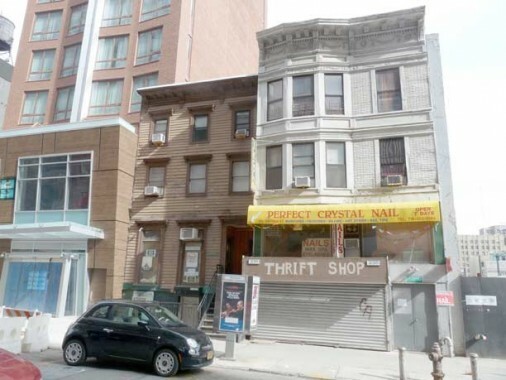 The stores are still the same they always were, though, affordable for the residents of bordering neighborhoods such as Gowanus and Bedford-Stuyvesant — Fulton Mall has not been totally upscaled, though there has been some luxury encroachment, as high rise apartment houses have begun to sprout on the surrounding streets. Fulton, Willoughby and Livingston’s shops still reflect a clientele that couldn’t afford the rent there, though, and I hope they always do. 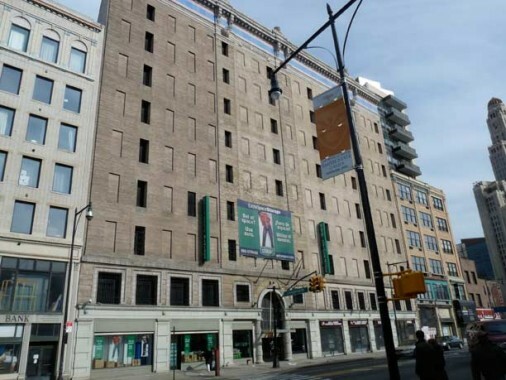 I had been past the old Namm’s Department Store at Fulton between Hoyt Street and Elm Place before — a roll call of Fulton’s grand department stores can be seen on my first Fulton Street page from 2004 — but I had not noticed a little detail on the Fulton-Gallatin corner until now. Adolph I. Namm’s dry good store originated in Manhattan in 1876 and moved to Brooklyn in 1896. By 1924, his son Benjamin Harrison Namm was running the show, and this fine curve-cornered department store went up here between 1924-1929. The outlines of “A.I. Namm and Son” can still be seen on the Fulton Street side. According to Emilio Guerra, who I trust in these matters (the link has more info on Namm’s than you would ever want), the architects were Robert D. Kohn and Charles Butler. Namm’s later united with rival Loeser’s, and in 1957 was snapped up by Federated/Abraham & Straus, which in turn was renamed Federated/Macy’s in the 1990s. Given that the architects were Kohn and Butler, the mystery for me is the name T.H. Von Deilen, which appears on thecurved corner above the Modell’s sign. Anyone have any ideas? 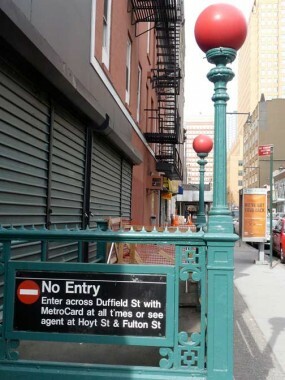 This is an exit-only subway staircase at Duffield and Fulton that serves the Hoyt Street IRT subway station, serving the #2 and 3 trains. 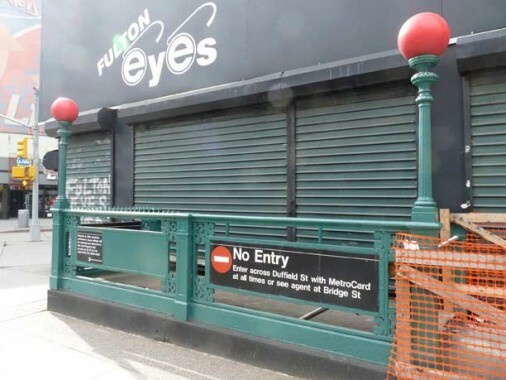 This is one of the last places in Brooklyn you’ll see IRT-style railings, which can still be glimpsed on Bronx el lines. The lamp stanchions are vintage as well. Red lamps indicate it’s never an entrance. In July 2007 I wrote: A group of buildings at 223, 225, 227, 231, 233 and 235 Duffield are believed to date to the Civil War era and are further believed by their owners to be former homes of abolitionists, if not stops on the Underground Railroad, as was the nearby 1846 First Free Congregational Church, later the African Wesleyan Methodist Episcopal Church on Bridge Street south of Johnson Street in MetroTech Center. The city has plans to seize the houses via eminent domain, demolish most of the houses on this stretch of Duffield and replace them mostly with parking spaces, and further develop 500 new hotel rooms, 1,000 units of mixed income housing, more than 500,000 square feet of retail space and at least 125,000 square feet of new office space in the area. 227 Duffield, though, the little building on the left, survives as a museum dedicated to the Underground Railroad: according to preservationists, this row of buildings on Duffield was home to heroic folks who helped runaway slaves escaping from the South during the Civil War. (conversely, it’s well-known that many NYC residents were mostly in agreement with the South during the war). For more, see Duffield Street Underground. 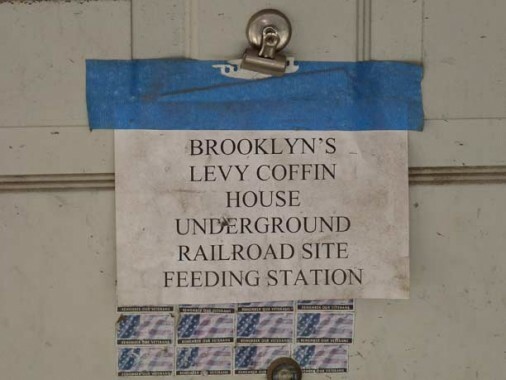 A sign on 233 Duffield claims it’s Brooklyn’s version of the Levi Coffin House. The original, in Fountain City, Indiana, is on the list of national historic landmarks. Brooklyn tends to treat its landmarks with much less TLC. 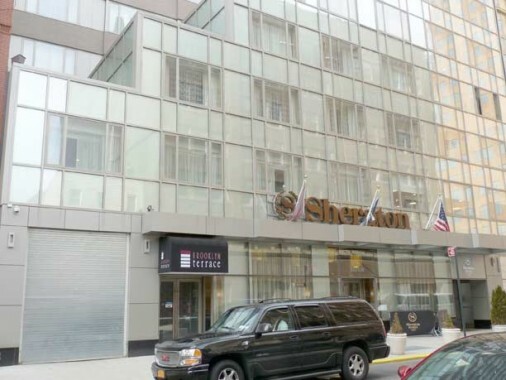 Brooklyn rolls on — across the street is another high rise, a Sheraton hotel featuring the swank Brooklyn Terrace rooftop lounge. 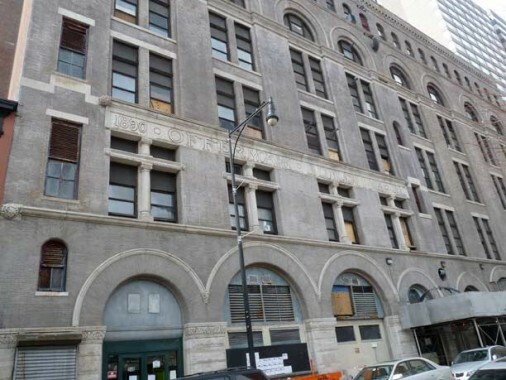 The Offerman Building, or Wechsler Brothers Block, actually fronts on Fulton opposite Hoyt, but is identified on the Duffield side. It dates to 1890. Notice the ground floor arches of varying heights. About that lamppost: In the early 1990s NYC needed a decorative longarm lamppost, and installed a set of these on 8th Avenue in Hells Kitchen and Flatbush Avenue in downtown Brooklyn. Later, molds for the classic “Corvington” longarm became available, and that became the go-to longarm post. 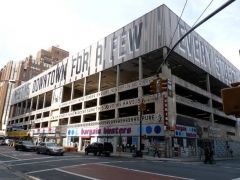 A Macy’s parking garage facing Hoyt Street, Livingston Street and Elm Place has been transformed by artist Steve Powers, who has placed unconnected phrasings onto the garage exterior and the walkway above Hoyt. 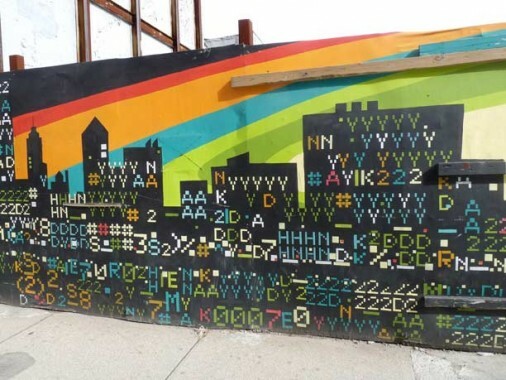 He has done similar artwork in Philly and Syracuse (of all places) that combine signpainting and street art. To me, the effect is rather similar to Jerry Johnson’s satirical ads that formerly marked the corner of Atlantic Avenue and Nevins Street a few blocks away. Powers’ point, which is largely objective, has some local shoppers mystified and some barely notice it. 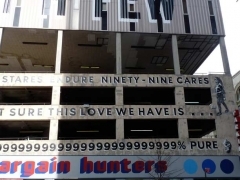 I find his work engaging — if the art is allowed to remain on the garage for a few years, it will age much like painted ads from an earlier age do and future Brooklynites may not be able to tell the two apart. Powers’ blog is firstandfifteenth. 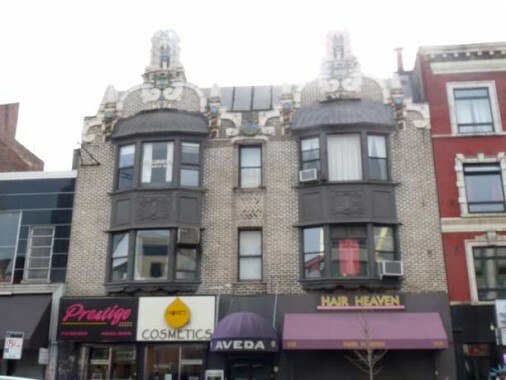 As Abraham and Straus grew in the early 20th Century, it acquired buildings on Fulton and built new ones on Livingston like this 1925-1931 Art Moderne classic [Van Vlech and Starrett, arch.] 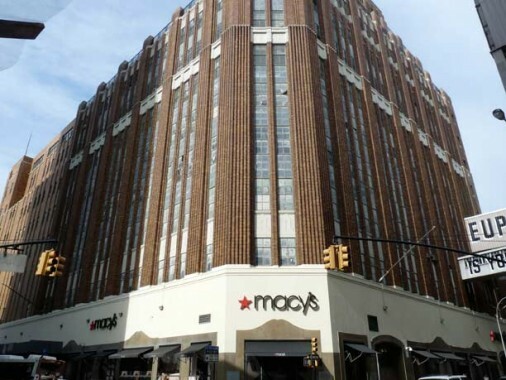 The present Macy’s is now an amalgamation of 8 buildings! I have mentioned my frequent trips to A&S with my parents before. It’s awhile ago now, but I think that while my mother and I trundled between departments, my father escaped to Willoughby Street, where there was a camera shop at Lawrence; there, he felt more at home. After over 40 years I don’t recall a lot about the A&S jaunts, except for the terrific elevators, which were operated manually by an attendant, who would pull a laver back and forth to make the doors open and close. I think I spent time in their kids’ book department until they eliminated it, and I also remember a rather sophisticated restaurant (not a lunch counter like Woolworths!) The best part of my journey was riding the B37 3rd Avenue bus, where I studied carefully everything that went past us out the window. In the late 1960s, our A&S jaunts were curtailed because E.J. Korvette’s opened a branch on Bay Parkway at the waterfront, and all we needed to do was take the B64 bus for 20 minutes. That Korvettes was called Ceasars (sic) Bay Bazaar last time I looked. ICY Signs, a collective associated with Steve Powers, hung some colorful signs in a Livingston Street window opposite Macy’s. The buzzwords seem compatible with Powers’ style. I imagine Sebadoh and the Eurythmics are two bands he likes. 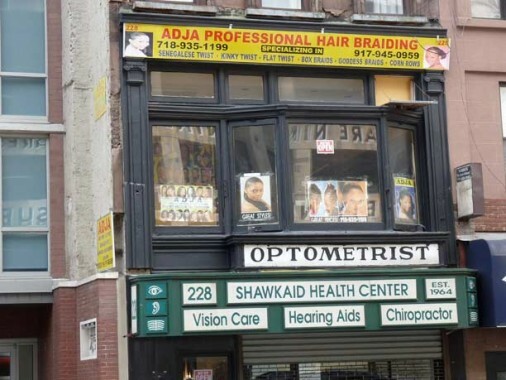 What attracts me to Livingston is a smattering of very old signs, like the serifed “Optometrist” on the second floor. It even looks older than 1964, when the store was founded. 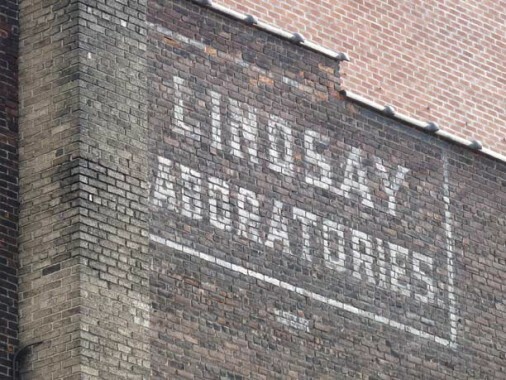 Meanwhile, Livingston has some vintage signs of a previous age. 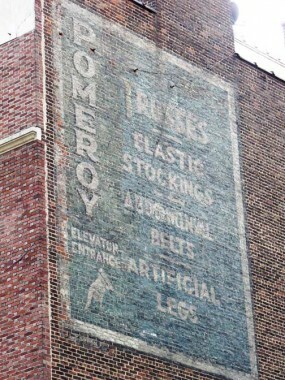 An outfit named Pomeroy formerly sold trusses, elastic stockings, abdominal belts and artificial legs. Nick Carr of Scouting NY was able to do a little research on the company and he even has photos of what the factory looked like. From the early 1800′s through the 1930′s, Pomeroy was a prominent maker of “surgical appliances” in New York City. Now, I’m no doctor, but some of these devices feel a bit like quackery to me. For example, “The Pomeroy Surgical Corset” promises to cure various ailments, including those where your internal organs start sliding below their normal position. 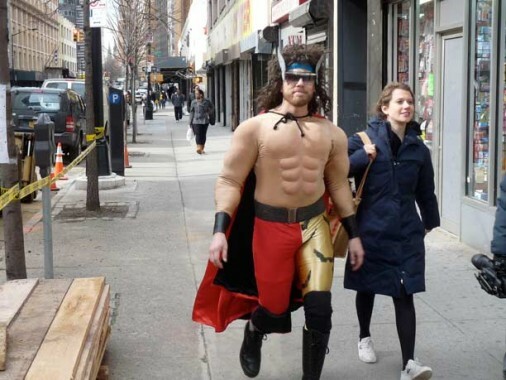 There were various costumed figures marching around Livingston. Liberty was selling the Liberty Tax Service and the first guy was probably en route to a kiddie party. 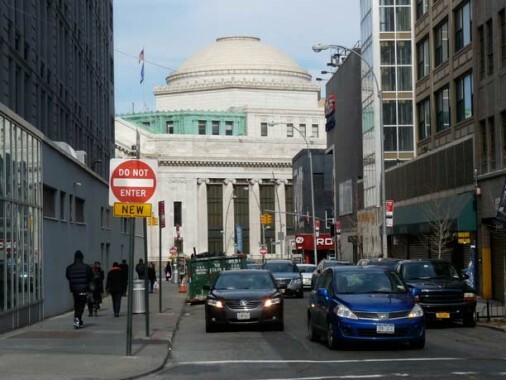 What’s likely the most impressive building in Downtown Brooklyn (it has competition like Borough Hall) is what used to be Dime Savings Bank, seen here looking north on Elm Place. The building features bas reliefs of the Brooklyn Bridge and the Roman god Mercury on the exterior, and large gilded versions of Liberty dimes inside. It was built in 1908 and expanded in 1932. Since the Liberty dime was first minted in 1916 (and lasted until 1945, when the Roosevelt Dime took over) they were likely added after that year. When Elm Place was first laid out in the early 1800s, there were probably a lot of elm trees around. 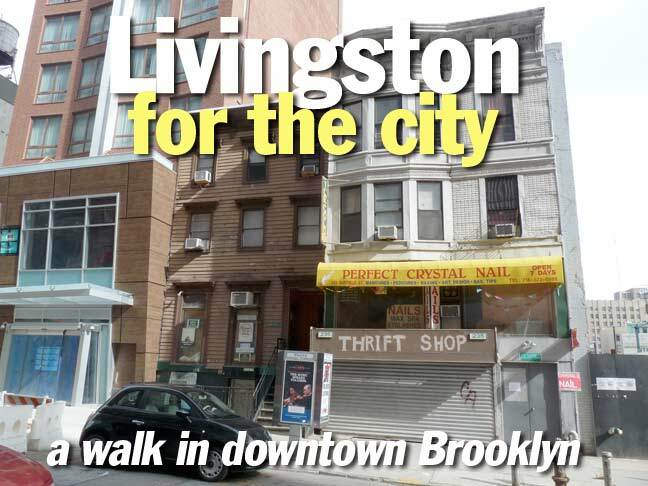 Though new buildings are filtering in, Livingston also contains its share of vintage architecture. 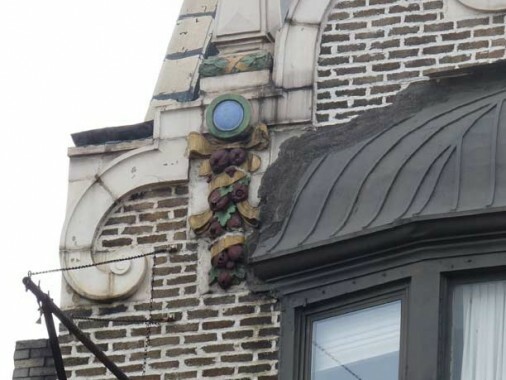 If you’re a fan of colored terra cotta, #308-310 Livingston is your kind of building. 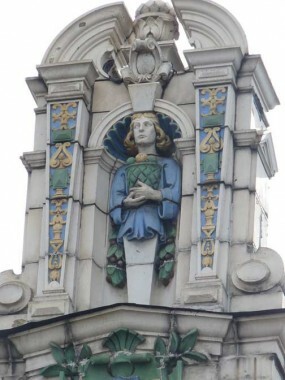 The twin pediments feature choirboy-like figures. A recent study says red meat is even worse for you than previously thought. 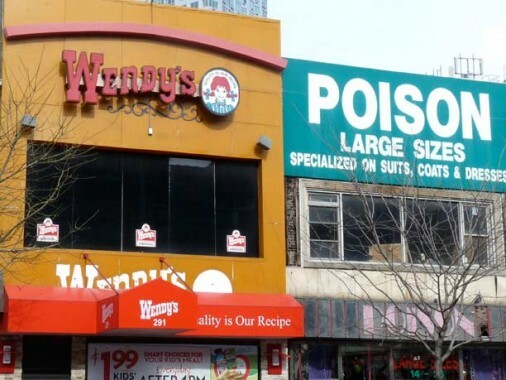 This juxtaposition of signage on Livingston is purely accidental. I think. 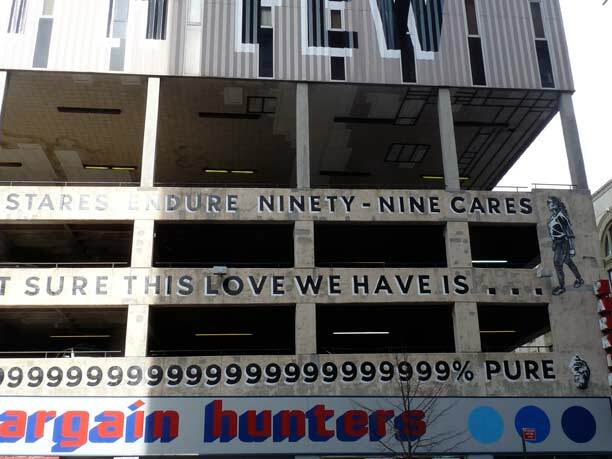 (This is the sort of thing Stephen Powers seems inspired by.) Regarding the study, it makes sense. Nature wants us eating raw leaves, pretty much, unfortunately; the raw fact is that nature could care less what our taste buds are attracted to. However, our civilization eats more processed crap than ever, and our lifespans keep edging up. Mind over matter, literally. We were not built to fly, but we make airplanes. We are built to eat leaves, but we eat cows and pigs and make drugs to counteract the effects. The development and evolution of the human mind has made us the great monster of history. There were once three buildings. One was too big, one was too small, and one was just right. Livingston and Nevins. 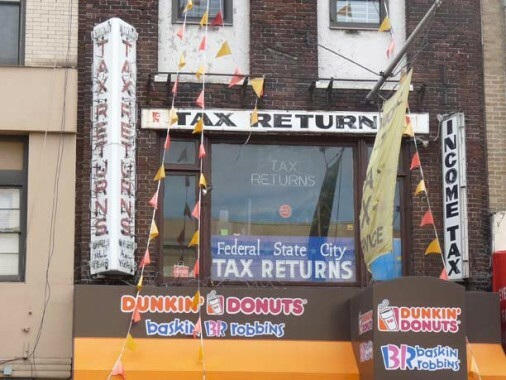 Livingston has a number of signs that have just been there forever, like the neon and painted tax returns signs as well as the vertical income tax sign. The Ministry of Love, actually Consolidated Edison headquarters, stands in a triangle formed by Nevins, Livingston and Flatbush Avenue. There’s actually an architectural genre called Brutalist, and this is Brutalist at its worst, from the dark and distant time that was early 1970s building design. 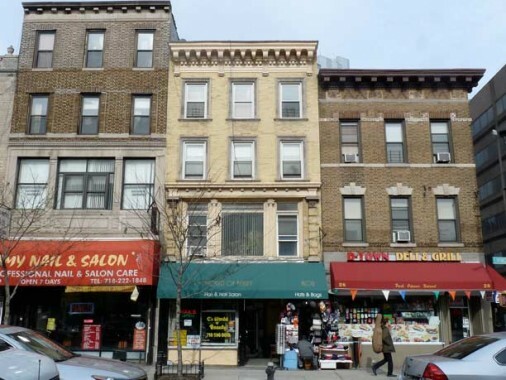 In 1926 Fox interests acquired control of the triangular property bounded by Flatbush Avenue, Nevins Street, and Livingston Street in Brooklyn. 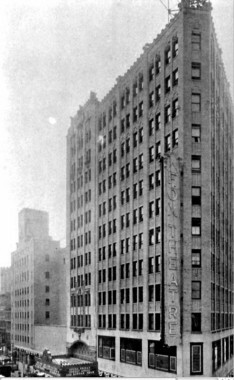 In 1927 the site, partially occupied by the Cowperthwait Building, was cleared. The cornerstone of the Fox Theatre was laid on September 27, 1927 at the junction of Flatbush Avenue and Nevins Street in the presence of numerous civic dignitaries, prominent members of the business community, and theatre representatives, Borough President James A. Byrne officiating. 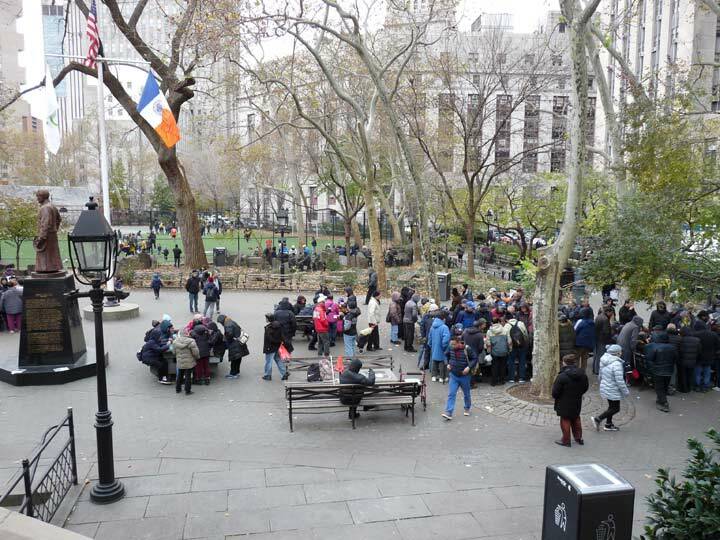 William Fox himself was not present, but what was said to be the first check he ever earned was enclosed in the stone along with the day’s Brooklyn newspapers. Historic Structures, where amazing views of the ornate interior can be seen. Toward the end of its run on Flatbush Avenue in the mid to late 1960s, WINS DJ Murray the K brought package rock and roll tours to the Fox. The Who and Cream made their NYC concert debuts at Murray the K shows. Such was the theater’s importance that from 1928-1971 the intersection of Fulton and Flatbush was called Fox Square. Note the inscription ‘M.I. Downing’ on #302 Livingston, on the right, likely the business the structure was built to house. A pair of defunct businesses, one distant, one recent, Livingston east of Nevins. 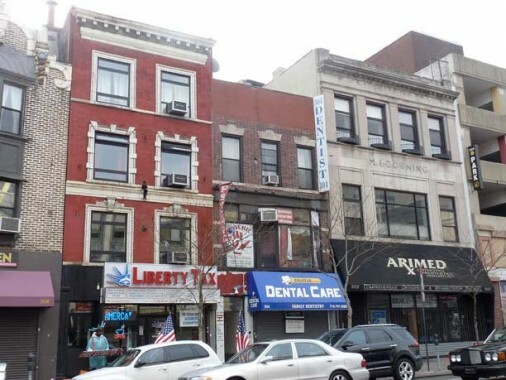 Flatbush Avenue between Fulton and 3rd Avenue has an unfinished or deserted quality; the development aurrounding the Atlantic Yards complex kicks in at 4th Avenue, and in between is dominated by the Brooklyn Academy of Music. Pioneer Warehouses, meanwhile, seemingly bides its time until it takes its turn as a large condo redevelopment. Not saying it’s happening — but it seems like a candidate to me. 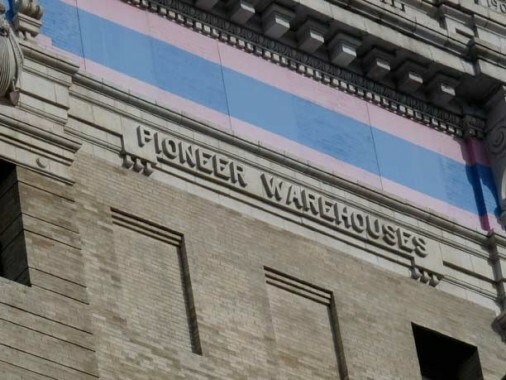 Established in 1896, the Pioneer Warehouse Company was an outgrowth of a family auction business initiated on Fulton Street 16 years earlier by Samuel Firuski. Choosing the name Pioneer to reflect what he perceived to be his position in the industry, Firuski acquired a parcel for his warehouse on a triangular block bounded by Flatbush Avenue, Rockwell Place and Fulton Street. It was a strategic location. The elevated ran down Flatbush Avenue and the Long Island Rail Road was moving to build a new terminal a block south at Flatbush and Fourth Avenue. 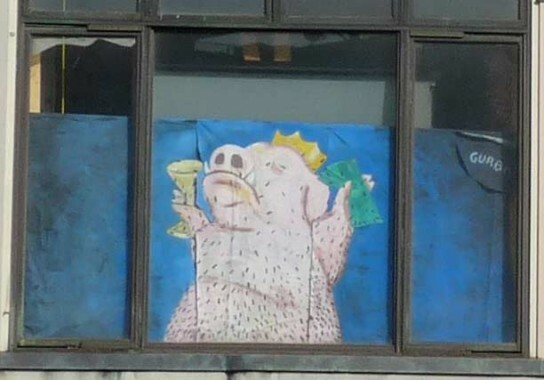 Perhaps an Occupy Wall Streeter placed the artwork featuring a crowned pig clutching a wine glass and a wad of cash in the window. 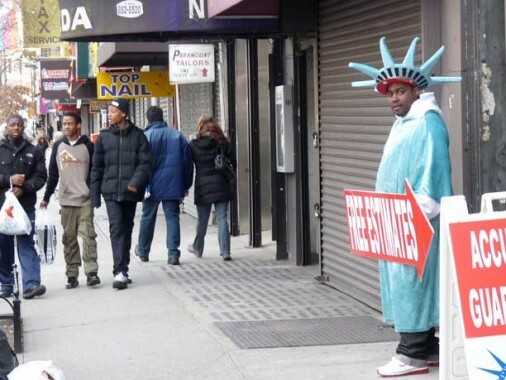 The man in the Statue of Liberty costume is promoting Liberty Tax Service. That is their promotion all over the country. The costumed people are called “wavers”. I work for Liberty seasonally in St. Peters, Missouri. I grew up in Queens and went to high school in Manhattan 1959-63. Moved to Missouri in 1982. Steve Powers must’ve spent a lot of time studying the labels on Dr. Bronner’s soap products. 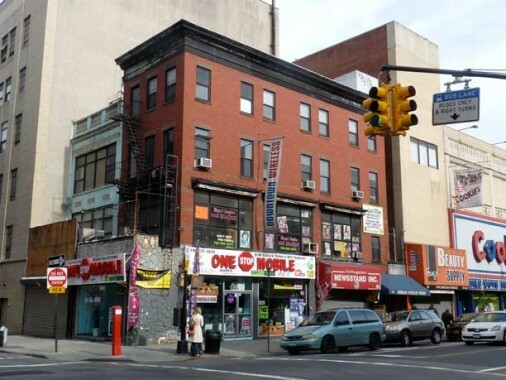 I worked at Bonds Clothing Store in downtown Brooklyn while going to college in the mid-60’s. 15 years ago, I couldn’t locate it, and I can’t find internet references. Where was it exactly, and what happened to it? The experience taught me that retail sales wasn’t my forte! Thanks. I saw that, but it doesn’t mention the Brooklyn store. I also worked at this store for a number of years. I would love to communicate with anyone who might have been employed there. The Who & Cream debuts were at a Murray the K show, but not at the Fox…it was at the RKO 58th Street. 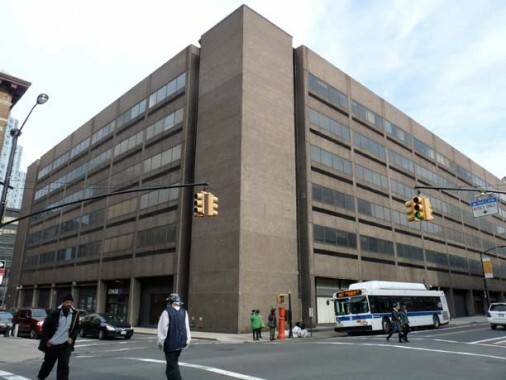 Re: Brutalist design: I’d hardly call that Con Ed building one of the WORST examples of the genre; at least it’s clad in brick and lacks the weird cantilevered layers of the truly horrible structures such as the Boston City Hall or the J.Edgar Hoover Building (F.B.I. headquarters) in D.C. Just about anything with the raw concrete surfaces that are so representative of the style and the era looks downright depressing after thirty or forty years (Washington’s Metro system, anyone? ), so I am thankful for the relatively benign examples like the Con Ed. into the Village often. In any case, it’s a great building, still standing. Yeah, Kevin, I would think that the consumption of red meat and pork products today is far more deleterious than ever before, especially when bovine parts in any condition are fed to the cows and pigs! [Those poor cannibal cows.] One can only imagine what’s in pet food (rotting pet carcasses?). So after that burger, everyone should go have a Frosty and fuggedaboudit for a while. (Nice to see you read Indian Country too.) One thing I haven’t forgotten: taking the then GG local to Hoyt & Schermerhorn to go shopping at A & S as a little kid. The stores were like a behemoth where one spent hours wiling away the hours. I well remember the kid’s book section, but at Stern’s on 42nd & Fifth Ave. in Manhattan. oh, sainted A & S!!! 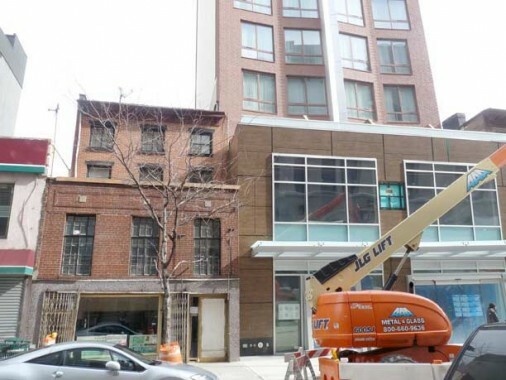 spent many of my saturdays in downtown bklyn visiting my orthodontist, whose offices were in the (late and lamented) Albee Bldg, which i believe was demolished to make way for some LIU bldgs. it was a gorgeous art deco blg at least 20 stories. we took the LIRR from south queens all the way to downtown bklyn.i remember being able to see the bklyn paramount from the window of my orthodontist. i will never forget the elevator doors in that bldg. about 3 or more stories high, bas relief, pure art deco. the stairwells – marble. it was i believe dedicated to the father of the playwright edward albee. we went to A&S, and lunched in juniors……. Pretty detailed but what about STUR-DEE? Forgot to mention the health food store that has been there since 1932 and is still in business. Nice article, but what really caught my attention is that STUR-DEE was not mentioned. 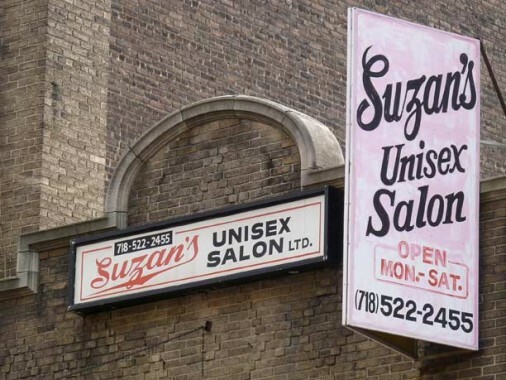 It is the health food store that has been on 222 livingston since 1932, and I also know that there is the cleansing that spa (a colonic place ) that has been in business for a while now too. I work around the area, and I go there a lot for their smoothies and the natural products that they carry. IM NOT ADVERTISING! From some research I’ve done in the past it’s very likely they would have gotten their soft-serve mix from local dairies, which are probably no longer in existence. I’d try small-scale dairies that make custard with high egg-yolk content. Maybe PA or VT dairies. Yes! I remember shopping with my mom and I couldn’t wait for the ice cream sundae in the basement of A&S. The best, Joyce, I agree! OMG Joyce! How well I remember that! In the basement of A&S. 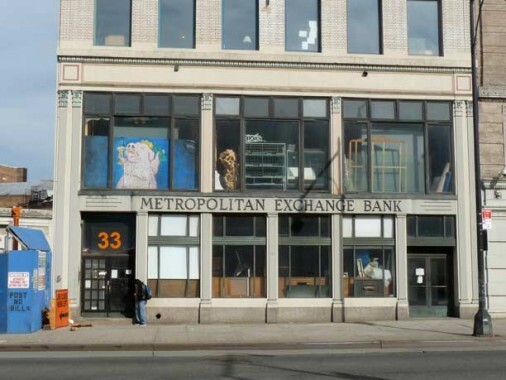 One of my fondest memories of old downtown Fulton Street! does anyone know what happened to the fish store that was first located on Willoughby st across from the telephone company. The store moved to Duffield street and disappeared widen construction began on Duffield st. The frayed the best butterfly shrimps and fish. I was wondering the very same thing, L!! I just loved that place. Great pictures…anyone remember Artie’s Music Store on Flatbush Avenue in the 60’s?..